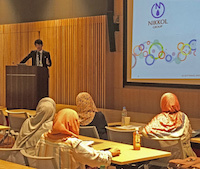 NIKKO CHEMICALS gave a presentation on “How to Capture Market Opportunity of Halal Cosmetic Market in SEA” at the International Conference on Halal Pharmaceuticals and Cosmetics held in Japan on 6 and 7 October. The conference was attended by many important companies and executives with global interests in the Halal market. I am certain all of you know very well about economic growth in South East Asia (SEA) and that for Japanese companies, including us, with a geographic advantage against Western countries, expanding business there is the most important theme of business. Especially, the cosmetic/personal care (PC) industry where our company mainly conducts business is the market which is expanding as the regional economy grows and it is unquestionable that the PC market in SEA will grow as more and more middle-class consumers appear. To capture the business opportunity in SEA, it is inevitable to attract Muslim consumers by developing products aligning with their specific needs. We see the obvious trend that more and more consumers care strongly about Halal from various political and cultural developments. However, according to our boots-on-the-ground research, as that trend goes stronger, more and more consumers feel uncomfortable about a variety of choices in the market and are still using many products by checking ingredients themselves even though they feel uncertainty about the origin of those ingredients. To solve that situation, more cosmetic makers are trying to launch Halal-certified products but, in many cases, finding raw materials which clear both Halal standards and their quality requirements become a major bottleneck to achieving this. Facing that situation, NIKKOL GROUP has tried to “Halalize” our products and production for many years with a belief that it is the opportunity to contribute not only for our business but also for the Muslim community. Starting from acquiring MUIS certification in Singapore in 2011, we are going to receive Halal-certification for our two main factories in Utsunomiya and Nasu, Japan. During the session we will share how we recognize the market opportunity in SEA and what we have done to receive Halal certification in detail.